People both young & old benefit from learning and practicing Meditation /Relaxation. Mindfulness in everyday life helps us to think more clearly, be more productive & focused and is a new way of life now for myself & my clients. By incorporating meditation into your lifestyle you will see the changes and come to realise just how much it can help you in your day to day life. The learning and practice by you is ongoing - It's just like learning to read or to ride a bike - it takes practice, patience and time. $2 from each client attending a class is donated towards bipolar research - my chosen charity - The Ian Parker Bipolar Research Fund, whom I am an Ambassador for. Join a workshop, a class or a private 1-on-1 session. Be amongst like minded people and see the positive changes in you. Our lives get so busy and at times we find it difficult to just stop and relax; we get caught up in every day issues. We focus on the breath & being mindful whilst listening to guided relaxation and music. Enjoy Life, Be Positive, Be Happy! 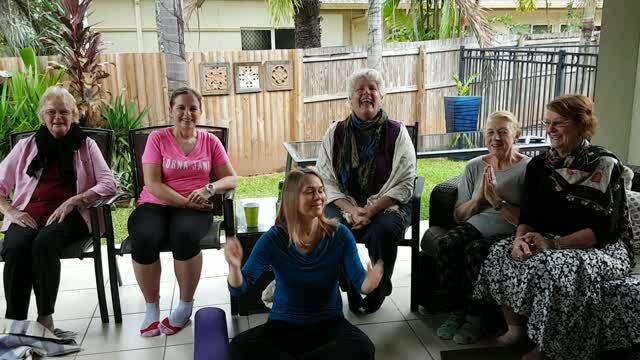 Meet new friends, be amongst like minded people and learn to transform your thinking by staying in the present moment. Meditation helps to balance and restore our brain, which is essential to our wholeness as a human being. Learn about the breath and how it is the link between the mind and body. Enjoy morning tea afterwards included in the morning sessions. Learn to recognise and trust in your own strengths and to witness your reality in the light of truth. Meditation of the mind and body results in a better balance and focus in our lives. This is a perfect opportunity to learn to rise above the mundane world in search for tranquillity, inspiration and enlightenment. Enjoy sharing these . . .
And whisper when we need comfort. And those who kiss us goodnight for a peaceful slumber. When tears become a burden. And rock us until the ache in our heart disappears. Get on with your life and stop worrying about what others think. Be truthful with others, and yourself, in your words, thoughts and actions. Listen to your heart and follow its guidance. Decide to find out who you are, not your body, not your personality, not your thoughts & beliefs, not your emotions, not some concept of your spirituality. Spend some time every day in silence. Don’t put yourself down. Be patient and gentle with yourself. It’s ok to feel your feelings, but don’t add to them with un-provable negative thoughts. Purify your body, speech and mind, in order to be a vessel of the pure Love Peace and Light that is your birthright and purpose of being here. Be thoughtful and kind to all beings. Do unto others as you would have them do unto you. Get out of your thoughts. Don’t assume or presume. Don’t project the past into the future. Practice bringing your attention to right here, right now in all activities, as often as possible. You don’t have to improve yourself, just to uncover the perfection that is already there, hidden within you. Embark upon the sacred journey to realise your true identity: the immortal, eternal Divine.